Draw people in faster than ever before. Ensure all event guests remain up to date with real time announcements. Our touch screen solutions allow you to showcase exclusive content, interactive schedules as well as display retail outlets for custom merchandise. 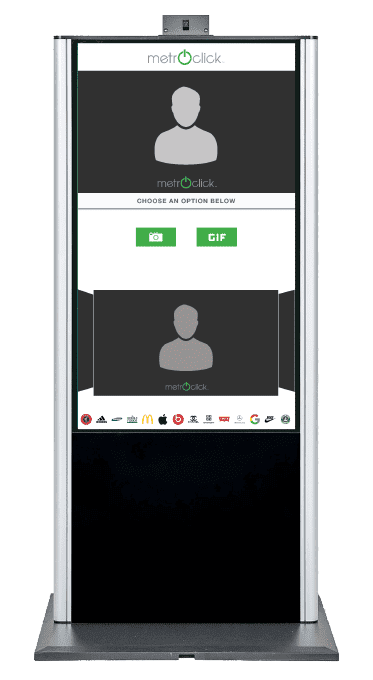 MetroClick’s digital platform is designed for client events, making it for the ideal solution for events of any size, tradeshows, as well as corporate and entertainment settings. Our live calendar provides guests real time updates on event timing and location. Manage event timetables, highlight key activities, and display interactive content to keep guests informed and engaged. MetroClick provides unique solutions incorporating features such as payment processing, printing, cameras, speakers, facial recognition and digital advertising for both in and outdoor events. MetroClick offers seamless mobile integration via our smart phone application. Bring your event to life by aggregating all of platforms into a single portal and/or interface. There is no better way to create brand awareness than your own carefully curated social media posts. Users will discover your social media presence by browsing through your online content and adding to the experience by uploading personal content with the associated hashtags. All of this aggregation will happen in real-time, creating a unique experience for the user in addition to showcasing the power of your brand. Add a new dimension to your event by allowing attendees to take pictures with customized and branding in the form of vinyl wraps, vinyl decals, and custom casing. Allow guests to access photos for editing and playback prior to sharing directly to Facebook, twitter, Instagram as well as MMS or email photos to yourself or all attendees. Redefine your experience using social media in combination with photobooth to allow event goers to check in on social media share their experiences. The Directory User Interface allows for building owners, hosts, and event managers to showcase interactive media or branded content on the main screen. Provide attendees with an interactive directory for your event space and sync it with your event feed in real time. 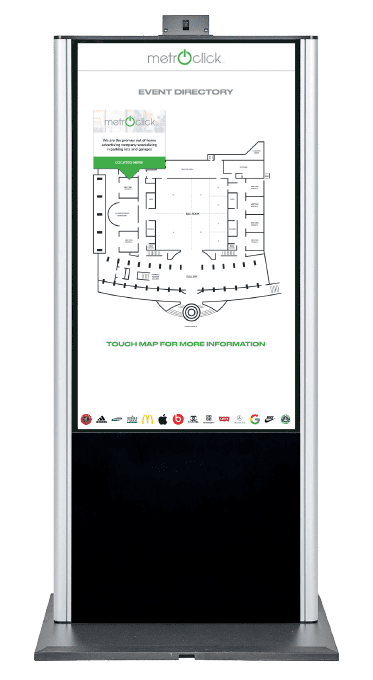 Help direct foot traffic, increasing guest engagement and engagement with an easy to use, all in one touch application. 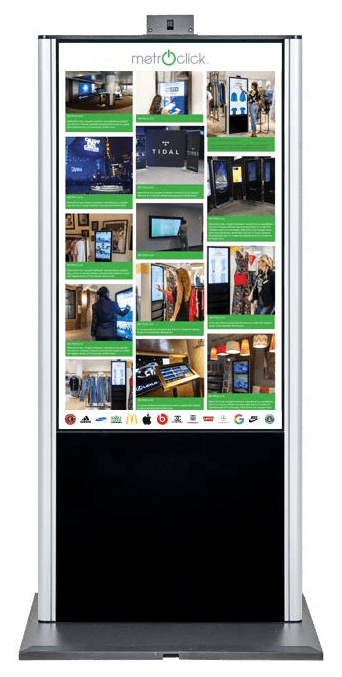 Leverage our digital directory to showcase a ‘virtual bulletin board’ that provides a great opportunity to advertise in-house; dining, gyms, and conference rooms. Our innovative Directory system created an additional revenue stream with Out of Home Ads being played. In this day and age it seems you can’t go anywhere without your smartphone fully charged. With the MetroClick kiosk charging stations, your guest will always have a convenient method of charging at any event. These charging stations can also be used for digital displays and advertising as well. The embedded digital display and optional vinyl wrapping allows any display to stay on brand with the event. We make everyone feel like they’re part of the show. MetroClick’s entertainment branch has innovated interactive solution for tours, concerts, sporting events, theaters, and more, engaging fans and creating unforgettable experiences. Stay Informed and Have Fun! Ensure guests keep updated on event times and have all the right info. Use our touch solutions to display exclusive content, print tickets, display interactive schedules, and sell exclusive merchandise. Our event software can also filter live feeds of what people are saying about your event on Twitter, Instagram, and Facebook. Ideal for event planners and entertainers, our systems are created exclusively for client events. With our CliqClik Digital Photo Booth solutions, users can take a picture with an event-themed frame to share on Facebook, Twitter, or Instagram. Our new virtual reality and green screen feature can also place event graphics in the background of any picture. Launching exclusive content about musicians or performers to fans, so they can interact and learn more about the show and the people they’ve come to see. Mesmerize fans while they wait on line with an interactive LifeWall screen, able to fit to any size wall. Keep them from being bored and use an otherwise static wall to showcase exclusive videos, pictures, and information with the multi-touch screen. This is only the beginning. The possibilities to engage fans are endless, and with a full consultation with our marketing and software teams, we can find more targeted ways to improve your unique event’s experience. Check out some of our entertainment debuts with the biggest names in the industry. Their fans love us, and so will yours. All of our event solutions are available for rent or purchase. Reach out to our team any time and in the meantime learn more about our unique solutions. Our custom trade show software and hardware are available to rent for the duration of your show, or available to lease for multiple events and shows.